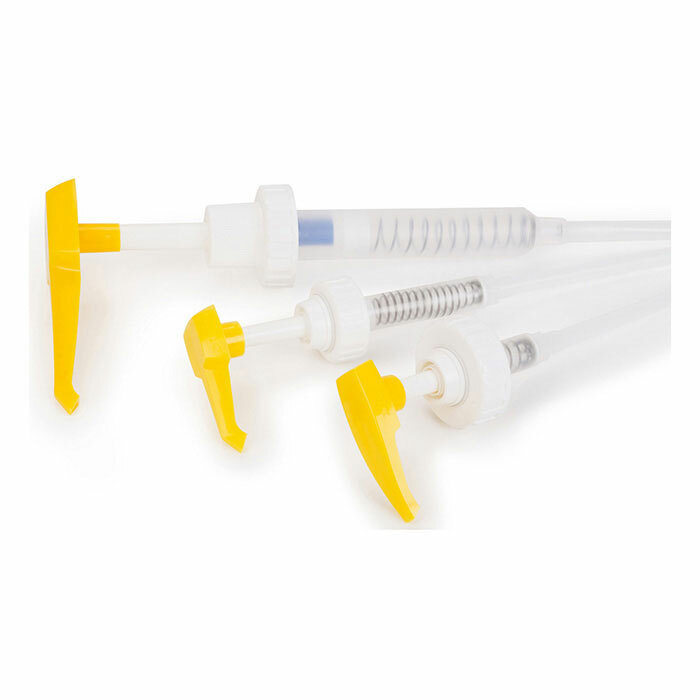 The 300 Mini Pumps Set contains one resin pump and two hardener pumps. 105/205-206 pumps deliver approximately 0.8 flu oz of resin/hardener with one full stroke of each pump. 105/207-209 pumps deliver approximately 0.9 flu oz of resin/hardener with one full stroke of each pump. As packaged, the pumps are ready to install on the Group Size B containers. A package of extension tubes for Group Size A containers is included with the set. Group Size C extension tubes are included in the 105-C Resin and in the 207-SC or 209-SC packages. Made of durable polypropylene, the pumps give years of dependable service. Note: If necessary, you can combine different group sized-as long as all of the pumps have a yellow head. To avoid confusion and possible off-ratio metering, 300 Mini Pumps have yellow heads, which should not be used in with any older pumps with a white head (301 and 303 pumps). Read and follow the priming, ratio verification and operating instructions that come with the pumps.